Me: Are you doing an arabesque? This book is fine. Each page is just a bunch of pictures of red things, or green things, or, weirdly, tan, lavender, or olive things (and so on). The drawings are unremarkable, and you will not hate it if your kid wants to look at the blackberries fifty times in one day. 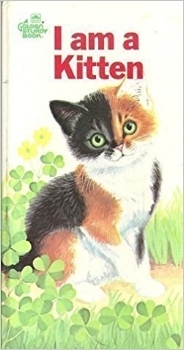 This is the worst of the Ole Risom “I am a [Animal]” series, which is actually a testament to how great the series as a whole is, since even the kitten suffers only from being forgettable. I will never understand why these books are no longer in print. None of them have much in the way of a narrative arc, so the artwork does a lot of the heavy lifting, and in I am a Kitten Jan Floog’s illustrations aren’t as lively as they are in I Am a Puppy--where Bruno the beagle puppy has perfectly chubby puppy joints and a mischievous look in his eye--nor as charming as John P. Miller’s lifelike wildlife in I am a Mouse or I am a Bear. The kitten does pretty basic stuff like drink milk and “live in a pleasant house” and . . . ten pages or so of other stuff I can’t remember. I have read this book about one hundred times, so the fact that I can’t remember it means it is totally lacking in irritating infelicities. It’s fine. I bought this book because my husband’s godfather gave our daughter a mobile of the solar system for her room. It’s biggest success is that it is not Hello World! Weather, which purports to teach children “basic concepts about the weather” but is actually just a series of problematic sweeping instructions for what to wear given a single weather variable such as “sunny” (wear shorts and a tank top!) or “windy” (wear earmuffs!). Today it is bright, clear, and sunny, so I guess we will all wear shorts and tank tops even though it is also 28 degrees! Thank goodness it’s not sunny AND windy, because I wouldn’t know WHAT to wear! Hello World! Solar System isn’t exactly a scientific tour de force, but it does actually contain some basic facts about the planets, and now when I talk about the sun or Saturn, my daughter points at the respective heavenly bodies in her mobile. It’s fine. My daughter was given this book at her pediatrician’s office and she LOVES it. It is kind of hard to read because it only has four or five words on a page (“Go, Baby, go! Go! Go! ), but it’s interactive and has lots of pictures of babies. It’s fine. This book offers a series of greetings to ocean-dwelling life forms. It includes the greetings “hola,” “howdy,” and “nice to see you”. It’s fine. I think everyone agrees at this point that The Three Bears is a weird story that centers on a petty criminal and offers a fairly unsatisfying conclusion from both a plot perspective and a character perspective. But it’s a classic, and this particular version is totally unremarkable at every turn; it attempts not a single clever twist or update. The three bears are bears, Goldilocks is a blonde human, the porridge is too hot, too cold, and just right, chairs get broken, and so on. The illustrations are fine and the prose is fine. It’s fine. This is the genre of “fine” where the illustrations are actually quite charming--Ethan Long’s big-eyed animals all wave cheerfully--but the text is just a single word per page, with animals saying “cheep” or “hoo” or whatever. Reading it is unobjectionable, but it won’t give you and your co-parent anything to discuss at dinner. Which, let’s face it, is fine. You have plenty of other children’s books to talk about. Other frequent contenders in the “so little text it’s a stretch to say anyone ‘wrote’ it” genre: “color” books, “counting” books, “animal” books. 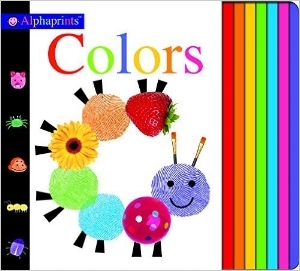 “Colors” seems to be a consistently inoffensive domain for a kids’ book to occupy. This one has animals in various colors created from oversize thumb prints and collage. I kind of hate when my kid wants to read this particular book, but that’s because of some complex geometry involving my daughter’s bookshelf, the windowsill and A/C unit in her room, and her oversize picture books. As a prop to make other books fit on the shelf around the A/C unit, Alphaprints Colors is superb. As a book that you read aloud to your kid, it is fine. This is a “lift the flap” book about a dog going to school for the first time. The class is taught by a bear (name: Ms. Bear) and has a total enrollment of Spot (a dog), one alligator, one monkey, one turtle, and one hippo. The animals sing a song, play dress up, paint pictures, and play on the playground. The only thing notable about it is that the alligator never eats any of the other animals, not even the monkey. It’s fine. I haven’t read any of the other books in the series, but they are probably fine, too. 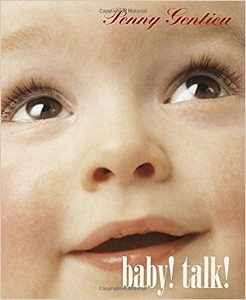 This is a sort of a baby encyclopedia with short text next to various animals--”animals that drink milk”, “animals that live on the farm”, “animals from Australia”. It’s hard to just read, but if your kid is like my kid that won’t matter because all she’ll really want to do is turn the pages to the animals with fur and gently stroke each one for a few moments while you say “that’s the baby kangaroo. The baby kangaroo is called a joey. The joey is soft; that’s the baby polar bear, the baby polar bear is soft; that’s the baby cow. It’s called a calf. The calf is soft.” Spending five minutes before bed this way is fine. In summation: these books, like many children’s books, are fine, and you probably won’t hate them.